This year we are celebrating St. Patrick’s Day with a heaping plate of shepherd’s pie. 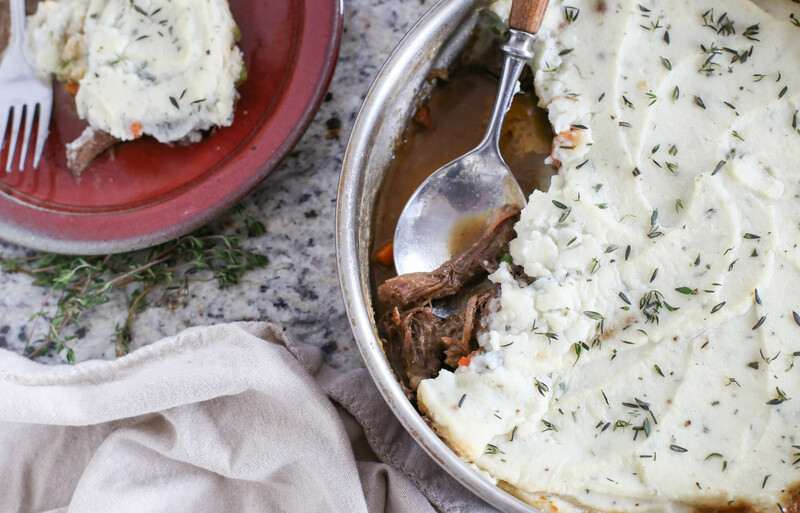 Tender beef braised in beer, smothered with rosemary mashed cauliflower instead of potatoes. Technically speaking, it’s cottage pie because of the beef. (I do believe that shepherds tend to eat lamb.) 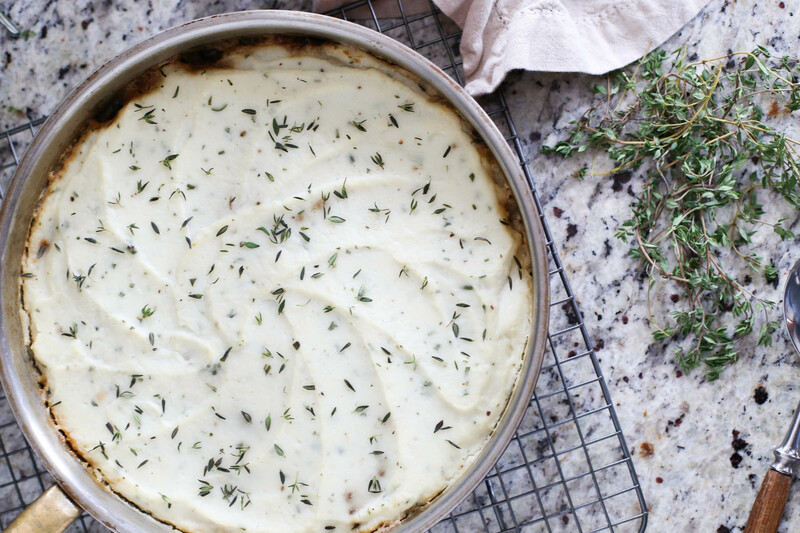 In the spirit of St. Patrick’s Day, or any time you need a hearty comforting plate of deliciousness, try out this pie. I will admit up front, there a few steps to this recipe. This is not a meal to throw together on a weeknight. But I would gladly make this for a dinner party or having friends over. Or you could make it just for two, keeping it all to yourselves, with plenty of amazing leftovers. From experience I have found that husbands tend to make these leftovers disappear rather quickly. The first step is to focus on the meat. 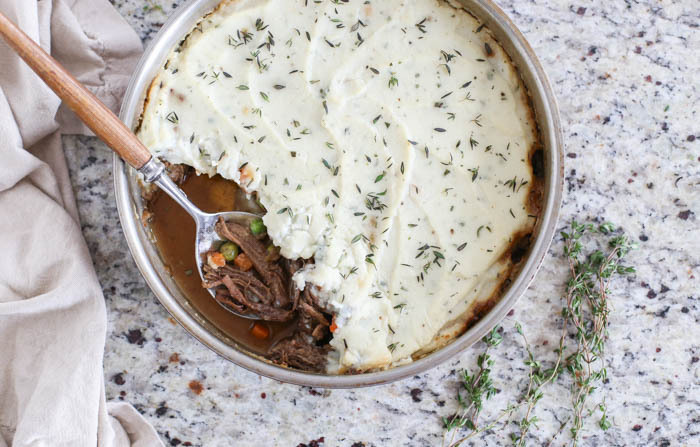 Usually shepherds pie has ground meat, but braising some beef reallllly takes it up a notch. 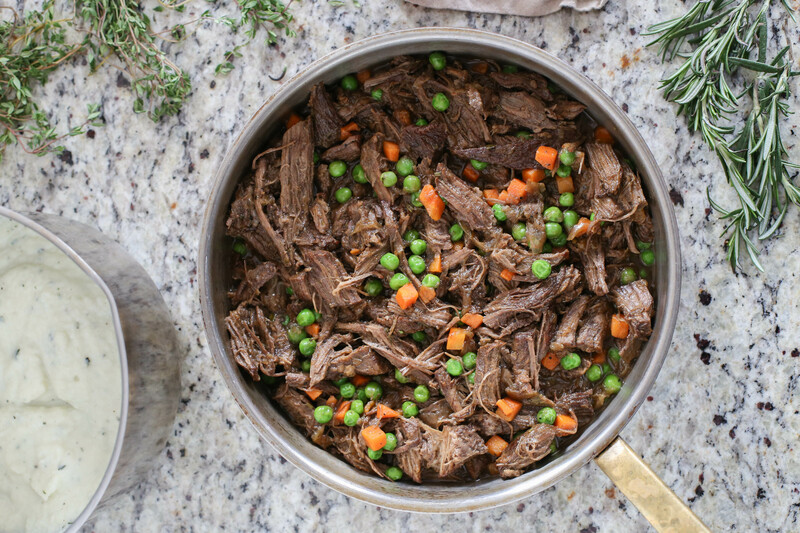 You can braise the meat in beef broth (Paleo-friendly) or red wine too (wine lover-friendly). In the spirit of the holiday I used beer, of course. Future experiments include whether it tastes different with Guinness versus a pilsner, etc. (Dad aren’t you so proud?) After quickly searing the meat to lock in the flavors, the meat is braised in the oven for 2-2.5 hours. This is entirely hands-off time, after which the meat will come out incredibly tender and flavorful. And oh, the smells you will get. The second step is to make the mashed cauliflower, perhaps while you wait for the meat to braise in the oven. Get the biggest cauliflower you can find. You could also do half potatoes, half cauliflower if you are not completely sold on the concept. Once the mashed cauliflower is ready it can sit off to the side until the pie is ready to be assembled. Once the beef is done cooking, move it on over to a large plate/cutting board and shred it to pieces with two forks. While you’re working on that, let all that leftover liquid still in the pot simmer on the stove. This will reduce the liquid to a thicker state, which will prevent the finished pie from becoming watery. Once the liquid gets to a consistency you like, stir the meat back in, and then stir in the frozen vegetables (I used frozen carrots and peas). 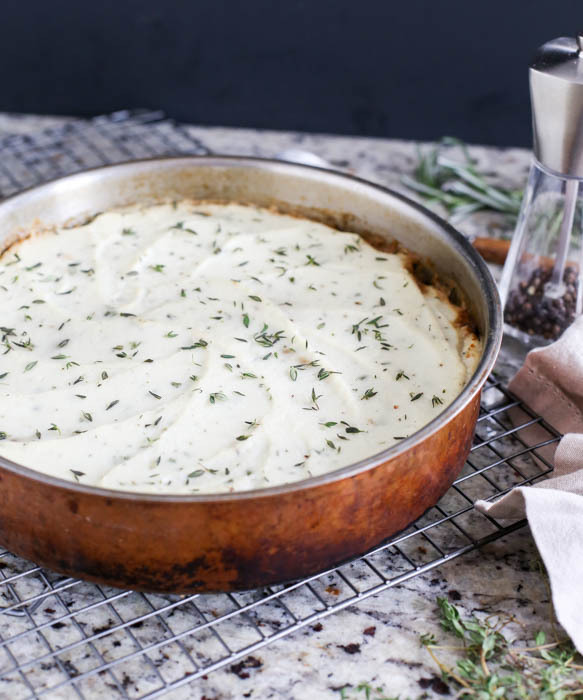 If you are using a Dutch oven or other oven-safe dish, you can top it with mashed cauliflower right there. Otherwise transfer the meat to a pretty baking dish and top with the mashed cauliflower, spreading it out in a smooth, even layer. Bake everything together for 15-20 minutes. If you want that browned crust look, turn on the oven broiler for a few minutes at the end. You’ll know the pie is ready when the sides are getting bubbly. Serve it up and savor. Preheat the oven to 300 degrees F. Pat the meat dry and then generously season with salt and pepper. Heat one tablespoon oil in a large heavy pot or dutch oven over medium-high heat. Sear the meat on each side for 3-4 minutes until browned. Remove to a plate. Add the remaining tablespoon of olive oil. Lower the heat to medium and add the onions. Saute for 3-4 minutes until soft. Add in the beer, thyme, rosemary, and one teaspoon of salt. Add the meat back into the pot, push down to submerge, and cover with a lid. Cook in the oven for 2-2.5 hours, until the meat is fork-tender and falling apart. Turn once halfway through. When the meat is halfway done cooking, start on the cauliflower. Place a couple inches of water in a large pot and bring to a boil. 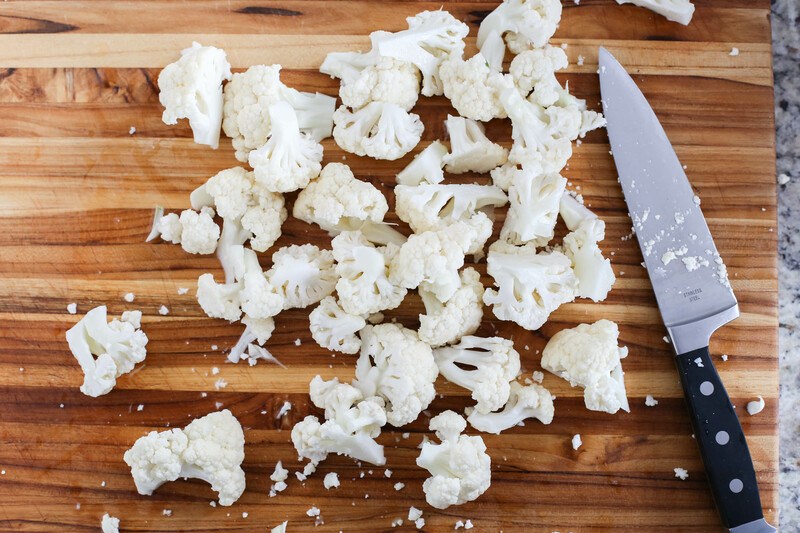 Once the water is boiling, place a steamer insert and then cauliflower florets into the pot and cover. Steam for 8-12 minutes, until completely tender. Drain and set the cauliflower aside. Place the chicken broth, butter, and rosemary into the pot and bring to a light boil. Simmer for 3-4 minutes until fragrant. Remove from heat. Add the cauliflower back into the pot. Use an immersion blender or food processor to combine ingredients until smooth. Add salt and freshly cracked pepper to taste. Turn the oven heat up to 400 degrees F. Spread the cauliflower mash on top of the meat mixture in an even layer. Bake together for 15-20 minutes, or until the top is lightly crusted. Let sit for 5 minutes before serving.